This church was built on what was presumed to have been the site of the house in which St Francis had been born. During a visit to Assisi in 1613, Fr. Antonio de Trejo, the Spanish Vicar General of the Observant Franciscans, was saddened to see that the house had become dilapidated. He subsequently managed to buy it and to persuade King Philip III of Spain to finance the construction of a new church on the site. Pope Paul V ratified the purchase in 1615 and blessed the first stone, which was laid by Bishop Marcello Crescenzi. The church was in use by 1621. 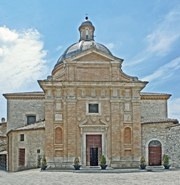 A community of friars from the Frate Minori Riformati (a strict branch of the Observant Franciscans) was installed in the adjacent convent in 1623. Bishop Carlo Salvatori consecrated in 1691, when it was dedicated to St Francis and to St Peter of Alcantara, the founder of the reformed branch of the Franciscan Order, who had been canonised in 1669. The design of the church is based on that of Sant’ Eligio degli Orefici, Rome. It has an octagonal floor plan with rectangular chapels on four of the sides, creating a Greek cross. The brick façade has four Doric pilasters and bears the arms of King Philip III, the Franciscan Order and Fr. Antonio de Trejo. ✴the Cappella di Sant’ Antonio on the right. The steps behind the Cappella dell’ Immacolata lead to the entrance to the house in which St Francis is said to have been born. (It can also be reached from inside the church. ✴the presbytery, which is said to stand on the site of St Francis’ bedroom. The cell in which St Francis was imprisoned by his father during the early stages of his conversion is on the left, between the Cappella del Crocifisso and theCappella dell’ Immacolata. The decoration of the chapels seems to have begun soon after the arrival of the friars in 1623. Much of this work is attributed to a team that seems to have been led by Cesare Sermei and to have included Vincenzo Giorgetti and his son, Giacomo Giorgetti. The altarpiece and frescoes in the presbytery are attributed to Cesare Sermei. As noted above, this altar is said to stand on the site of the bedroom of the young St Francis. Its altarpiece depicts a dream he had here, in which he saw a palace filled with flags, each of which was marked with a cross. When he asked for whom they were intended, a voice said that they were for himself and his knights. He thought that this meant that he would find glory in battle, and he set off to join the papal army. However, another vision told him of his true vocation and he returned to Assisi. ✴the five Franciscan protomartyrs in Morocco in 1220, on the right. ✴Adam and Eve in the Garden of Eden (on the right wall). They formed an iconographical whole with the original altarpiece of the Immaculate Virgin (above): Mary, the second Eve, had been born without sin. ✴two kneeling Franciscan, SS Antony of Padua and Paschal Baylon, venerating the Eucharist in a monstrance at the upper left. 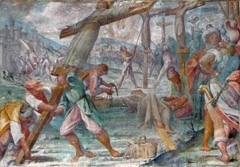 •the crucifixion of 26 men (Franciscan and Jesuit missionaries and their converts) at Nagasaki, Japan in 1597, on the right (illustrated here). •SS James of Capistrano and Albert of Sarteano. 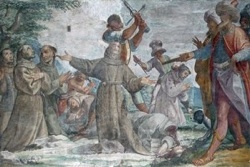 (The first and last of these pairs of saints were prominent Observant Franciscans). These panels and monochrome frescoes are attributed to Cesare Sermei. 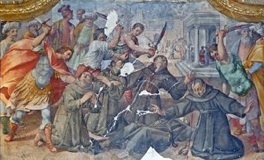 In this fresco on the right wall, St Clare repels the soldiers of the Emperor Frederick II at San Damiano by holding up the consecrated Host. The altarpiece, which is attributed to Vincenzo Giorgetti, depicts St Bernardino holding the symbol IHS, the holy name of Christ, with SS Bonaventure and Louis of Toulouse and two other unidentified Franciscan saints. 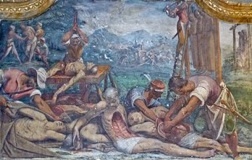 These monochrome frescoes, which are attributed to Cesare Sermei, include this one depicting the death of the saint.